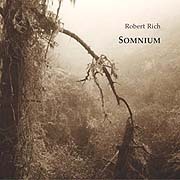 "With Somnium, Robert Rich has meticulously crafted a fresh studio interpretation of his notorious all-night Sleep Concerts, incorporating newly recorded electro-acoustic, electronic and environmental textures, with elements created for the original live events. Somnium guides the listener through an ever-changing dreamscape, with levels of subtle detail that reward both active attention and background listening. Deep and sonorous, mysterious and diffuse, liquid and hypnogogic." The term "Sleep Concert" can be a bit misleading, as it implies that this music is intended to help you sleep deeply. On the contrary, when you play Somnium at night, you may find that you sleep less deeply, and wake up more often. The idea is to let the music incorporate itself into your perceptual framework during the night, to create a sonic surround, an environment for unique states of consciousness. The music is aimed at the nebulous territory that exists in your mind when you are hovering between awake and asleep, when you are still aware of your environment, yet detached, when your half-sleeping mind wanders into the realm of hypnogogic images and dreamlike non-linearity. You might find that this music can act as a trigger for these flowing thoughts, and the activation of the environment around you can help you to skate around the edges of sleep, with one foot in the dream world and one foot in the room where you are sleeping. The experience of listening to Somnium in your home will differ from the experience of audience members during the Sleep Concerts that inspired this music. In the concert environment, an additional state of heightened arousal can occur from social factors, whereas the environment of the home is more relaxed. At home you will have more choices about the way you listen to this music, so the music must also conform to these different possibilities. Certain things happen when many people sleep in a room together. In general, people sleep less deeply. One of the more mundane reasons for this is snoring. An estimated 10% of the population snores, which means that in a room with 50-100 people, some will snore. Since the music is generally very quiet, snoring can become invasive (and sometimes it's quite funny.) Besides snoring, other interruptions will doubtless invade the Sleep Concert ambience. Among these may be traffic sounds, car alarms, sirens, or people walking around in the room when they get up to use the bathroom. Audience members may also notice my presence in the room as I work behind the mixer. The simple noises of other people can keep listeners in a lighter sleep. Interestingly, people become more physiologically activated merely by being in the proximity of other people. Perhaps this arousal is a purely chemical phenomenon. This is one of the interesting features that distinguish a live Sleep Concert from listening to Somnium at home. In the act of bringing a group of people together in the same room, we create an energized environment, which can contribute to the intensity of personal experiences. But for these factors to contribute to an interesting aesthetic experience, listeners must combine this activation with an increase in attention to internal states of mind. The music helps to intensify this internal focus. You can use Somnium at home in the same way. The musical environment of Somnium can act like a lens to sharpen mental images, a stimulus to help you generate internal realities. Some of the sounds are abstract, blurry, hard to separate from the background. Other sounds evoke natural environments, open spaces, insects and animal calls, wind or rain. The music can replace the acoustics of a room with a shifting virtual soundscape. To get the most out of Somnium, I recommend that you focus on several aspects of the sleeping experience. The most interesting experiences will occur in the transitions between sleeping and waking, and later when you are dreaming. Stage 1, non-REM sleep is the transitional stage of sleep, when you are still partly conscious of your environment. This distinguishes it from Rapid Eye Movement sleep (REM), when you have the most coherent dreams. During the transitions into Stage 1 sleep, you might have dreamlike thoughts and visions called hypnogogic images. Hypnogogic images are often less organized than true dreams, and often come blended with a semi-awareness of your environment. If you pass from this stage into a deeper sleep, you will not remember these images and thoughts. But if you can linger at the edge, slipping in and out of stage 1 sleep, you can ride along the edge of your own awareness. You can use the music as a focal point to hold yourself right at the brink of sleep, to help you maintain this hypnogogic state like a surfer uses gravity to stay on the leading edge of a wave. During these hypnogogic experiences, you might find that the sonic environment triggers dreamlike hallucinations, evoking fragile new mental landscapes. You might also remember more dreams while sleeping with Somnium, and they might be more vivid and intense. The reasons for this again relate to the activated environment. In order to remember a dream, you must wake up from it. The more you pay attention upon awakening, the more you will remember and the more vivid the memories will be. One of the more interesting dream experiences you might encounter is lucid dreaming - when you become aware that you are dreaming while still in the dream. Once you become aware that you are dreaming, you can affect the action within your dream, letting you explore the dream world actively rather than as a passive observer. Lucid dreaming becomes possible when you pay attention to the signs that you are dreaming, when you attend to your conscious processes. You may find that the activating nature of the Somnium environment can help you to pay closer attention to your mental states, and may even help you have a lucid dream. For some people, more intense dreams can become unpleasant, due in part to negative expectations and mental habit. Self-awareness, and lucid dreaming in particular, can help overcome some of these habitual reactions. When you dream, your mind is trying to interpret current physiological and environmental conditions, and these interpretations can become incorporated into dream content. If your body starts to generate more energy or tension, the brain can interpret this arousal as fear, and the night's dreams might develop some dark overtones. However, the brain can also interpret arousal as mystical ecstasy, joy or sexual energy. All of these feelings are closely related in the body, and they relate closely to past experiences, expectations and environmental cues. The music on Somnium does not intentionally evoke any specific images, light or dark, but rather hangs in an indistinct place which you can interpret in many ways, like the ink-blots of a Rorschach test. The dream journey resembles a shaman's journey, in that shamans know that they carry with them their own expectations when they enter their spirit world. Likewise, your past and your preconceptions will influence your dreams, along with your current environment. Throughout Somnium, the music gets quite deep, it explores the shadows. The music is also quite gentle. If you open yourself up to the possibility of intense experience, you can explore your mental states with an open mind. Even the shadows contain useful information. The more you pay attention, the more you might find. Rich uses his dramatically extended canvas to allow his already naturalistic soundscenes to stretch further, with even subtler nuances in their prolonged evolutionary processes. He produces sustained atmospheres with various synths, processed flute and piano, steel guitar chimes and bowed metal. Buried within the continual flow are environmental recordings from California, Iowa, Minnesota, Washington and Mexico; you'll hear traces of wind, water, wildlife and Rich's own stew of organic glurp, as well as the sounds of electric fish! The first of three parts (between 2 and 2.5 hours each) opens with hovering flute drones and living textures (and no, I'm not going to do the entire play-by-play description... just a synopsis) which very gradually give way to the starker glare of a thrumming fogbank from which mournful dove-like calls seem to emerge. A bit more desolate/dangerous (and pleasantly so!) the second part begins as a windblown radiationswamp of gurgling murk; ringing essences shift almost imperceptibly into a seering bath of caustic streams, laced with sizzling activities. Quieter airs await when the third part comes to life with subdued flutters of ephemeral tones drifting through peaceful territories. Robert Rich always delivers quality, and now is able to provide an amazing quantity as well! If you're an ambient fan who owns a DVD player, you need Somnium. If you don't own a DVD player, get one. My apologies to Robert, Hypnos, Release and the world at large for taking so long to document this monumental A+ recording. Let's hope others who take advantage of this new-ish medium do it as successfully. Robert Rich takes us again into the land of dreams and darkness with this most unusual seven-hour audio DVD. Since the '70s, Rich has presided over "sleep concerts" � all-night events where the audience actually is supposed to sleep through the performance. The sound is intended to induce altered states of consciousness, lucid or surrealistic dreams, and even visionary experiences. These avant-garde sleep-ins would be the exact opposite of frenetic "raves." With Somnium, Rich provides the soundtrack for a listener to re-create the "sleep concert" experience, whether alone or with friends. There are instructions on the endpapers on how to set the soundtrack, how much volume to use, and what you might expect while you are sleeping as it is playing. The very concept of Somnium presents a problem to the reviewer. How can I accurately review music that I sleep through? How much would I remember? The logistics of listening are difficult, too: due to measures taken to preserve audio quality, the DVD has no "navigation." This means that the soundtrack is only divided into three long sections, ranging from two and a half hours to two hours, and you can't fast forward or "rewind" while listening to a section. In order to hear what is near the end of a section, you have to listen all the way through. Perhaps in the ideal I would follow Rich's instructions and sleep through it, reporting not on the sound but on the dreams and altered consciousness (if any) I felt. But I decided (with apologies to Mr. Rich) to disobey the instructions and listen all the way through while awake. I listened in three separate sessions, paying attention to the music rather than my state of consciousness. Section 1 leads into the virtual night with soothing drones from synthesizers and low flutes, accompanied by the sound of rain. The tones are in Rich's "signature" microtonal "just intonation," giving it a mysterious Oriental quality. Throughout this long night, in all three sections, environmental sounds surround the listener/sleeper, especially water of all kinds from rain to gurgling streams to splashes to ocean waves. There are night-insects and chirping birds, and the sound of wind and breath. In the middle section 2, representing the deepest part of the night, the synthesizer drones become atonal and sometimes very low; at a quiet volume they would be nearly inaudible. There is also a peculiar, irregular popping sound, perhaps derived from water droplets, which is the only "percussion" on the soundtrack; otherwise, there is no recognizable rhythm at all, just long drones, punctuated by somber bell tones. In section 3, as the night recedes, Rich's harmonies switch from dissonance or atonality into a beautiful tone-cluster around a ninth-chord, and the music becomes slowly louder. It's as if you can "hear" the brightening light before the dawn, and the coming of day. As the night ends and sleepers awake, the synthesizer drones fade away, leaving only the springtime chirping of sunlit birds. Musically, Somnium is in line with Rich's other long-form ambient releases such as his Inner Landscapes from 1985, re-released 1999, and his 1998-99 Humidity, both from Hypnos. But Somnium mercifully lacks the nightmarish quality of the other two albums; there are no disturbing sirens or screams, no harsh harmonies or thudding rhythms. Perhaps a "listener's abridgement" of Somnium could be released in a single-CD format, for those who want to hear at least some of it while awake. It is a gentler, if still suitably dark, evocation of the mysteries of slumber and night.